Flexense develops enterprise-grade data management software products for disk space usage analysis, file classification, duplicate files search and removal, rule-based file management, disk change monitoring, file integrity monitoring, high-speed file synchronization and data migration, bulk file delete and secure data wiping operations. Customers are provided with multiple desktop and server-based product versions optimized for enterprise environments. DiskBoss is an integrated data management solution allowing one to perform disk space usage analysis, search, classify and categorize files, search and remove duplicate files, organize files according to user-defined rules and policies, copy and synchronize large amounts of files in a fault-tolerant way, monitor disks and directories, perform bulk file delete and data wiping operations, etc. Users are provided with multiple desktop and server-based product versions, which may be configured and controlled locally or through the network. DiskPulse is a real-time disk change monitoring solution allowing one to monitor one or more disks or directories and detect file creations, modifications, attribute changes and file delete operations. Users are provided with multiple desktop and server-based product versions capable of sending E-Mail notifications, executing custom commands, saving disk change monitoring reports or exporting changes to an SQL database when a user-defined number of changes are detected. DiskSavvy is a disk space usage analyzer allowing one to analyze the used disk space in disks, network shares and NAS storage devices. The user is provided with multiple desktop and server product versions capable of performing advanced analysis operations, generating pie and bars charts, saving disk space analysis reports into a number of standard formats such as HTML, PDF, text, Excel CSV and XML and exporting disk space analysis results to an SQL database. DiskSorter is a file classification solution allowing one to classify and categorize files in disks, network shares and NAS storage devices using customizable file classification plugins capable of categorizing files by the file type, size, last modification dates, user name, etc. The user is provided with the ability to generate pie charts, save file classification reports to a number of standard formats such as HTML, PDF, text, Excel CSV and XML and perform file management operations on categories of files. DupScout is a powerful duplicate files search and removal solution allowing one to detect and cleanup duplicate files in disks, network shares and NAS storage devices. Users are provided with multiple desktop and server product versions, which are capable of processing large amounts of files and allow one to replace duplicate files with links, move duplicates to another location, compress duplicates, delete duplicate files and generate HTML, PDF, text, Excel CSV or XML reports. 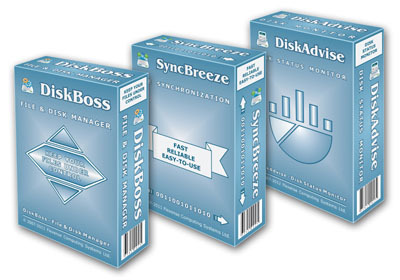 SyncBreeze is a powerful, easy-to-use and fast file synchronization solution allowing one to synchronize files between disks, directories, network shares and NAS storage devices. SyncBreeze provides multiple one-way and two-way file sync modes, periodic file synchronization, compressed file synchronization, real-time file synchronization and a large number of advanced file synchronization options allowing one to customize the product for user-specific needs. VX Search is an automated, rule-based file search solution capable of searching files by the file type, category, extension, file name, location, size, creation, modification and last access dates, user name, file attributes, JPEG EXIF tags, etc. The user is provided with the ability to categorize, filter, copy, move or delete file search results, generate various types of pie charts and save file search reports to a number of standard formats such as HTML, PDF, text, Excel CSV and XML.